Relax. Refresh. Restore. Re-connect. Remember. Relate… Re-awaken. As used by the National Park Education team across the country! The blindfold drum stalk – what guides you in your work? 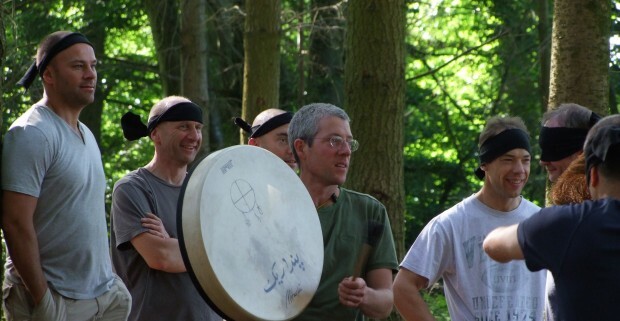 The natural musicians activities are effective and fun icebreakers, community builders, leadership and team building tools for corporate away days, natural leadership and team building events. Being in nature helps staff relax, restore balance, shake loose some inhibitions, re-connect with each other and refresh their relationship with the planet that supports us all. The activities help us re-awaken and remember a sense of harmony with nature – both our own and that of our planet. Like an orchestra, we listen, work and perform as individuals in teams, and together towards a common goal. Save the planet! Outdoor activity with no gadgets and gizmos and very low carbon fuel emissions! Bring a bit of natural harmony and funky beats to your corporate day. Along with Chris’s other facilitation and nature connection skills to reate the perfect mix of foraging, bushcraft, land art, games, challenges, presentations and storytelling to bring out the best in your staff for your business. When people are deeply connected to themselves, each other and nature it is becomes natural for them to do their best in a work setting – whatever the weather! Wholeland helps put a love for our selves and our world back into businesses big and small, sheds light on connections to natural resources cycles and uses successful natural design to inspire and create regenerative business practice. Watch the video of “When I was a walking in the deep woods” here – from the launch of the Forest school Association with 200 members.